in real-time, with results in minutes. 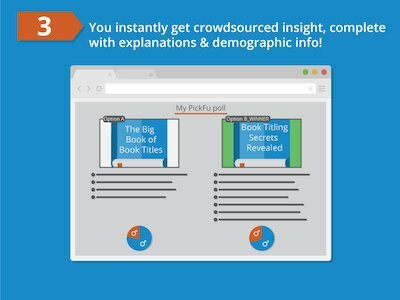 Use PickFu's platform to publish polls to a target audience. Your polls include a single question and up to eight (8) options for comments & comparison. The answering audience can be targeted within PickFu's panel, or you can poll your own audience. 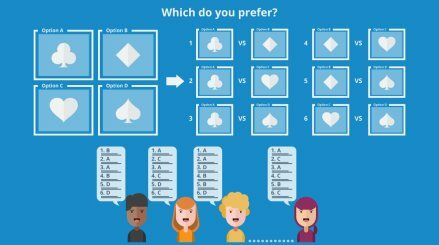 Starting a PickFu poll takes less than one minute* - just ask your question and provide your options. "Which book cover do you prefer?" "Which name do you like for a natural skin care brand?" "Which image are you more likely to click on in Amazon search results?" 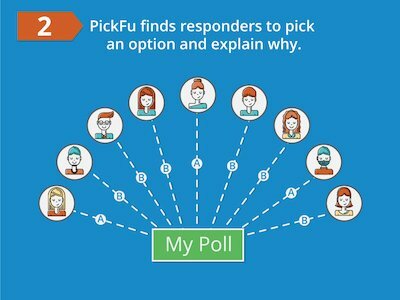 When you publish your poll targeting PickFu's audience panel, we immediately make the poll available to our audience to answer on a first-come, first-served basis. We'll even proactively notify potential respondents to come provide feedback. All respondents are required to fully complete your poll and provide a meaningful written comment explaining their choice(s). 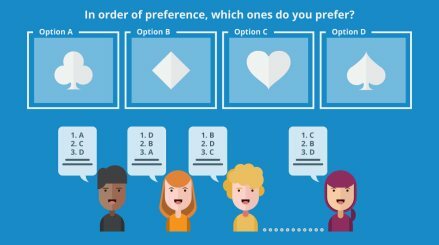 Depending on the type of poll, respondents may be asked to provide a 1-5 star rating, vote on the best of a pair of options (sometimes multiple times), or rank a set of options in their preference. Once your poll is published, responses will start appearing in seconds, in real-time. When all responses have been gathered, PickFu will calculate the winning option (if applicable), and also show demographics of the respondents who answered your poll. Filtering: View comments by respondents matching specific demographics (e.g. females only). Statistical Significance: Where applicable, PickFu will tell you if a poll result is statistically significant. Follow-up Questions: Intrigued by a respondent's comment and want to know more? 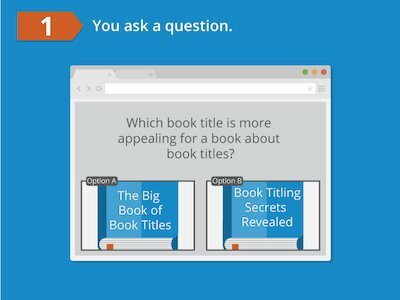 PickFu lets you ask a follow-up question to uncover more insight. Have a single idea to test or an open-ended question to ask? The Solo poll enables you to solicit feedback on one concept, without creating multiple variations of it. The PickFu Head-to-Head is a preference poll where 2 to 8 ideas are presented to respondents in head-to-head matchups, meaning two at a time. For each matchup, respondents vote on their favorite of the two options presented and provide a written comment about why they chose one over the other. Each idea is tested against every other idea in the set - sort of like how in a softball league, each team plays every other team. These paired matchups will be aggregated to reveal an overall winner and rank the rest of the set. 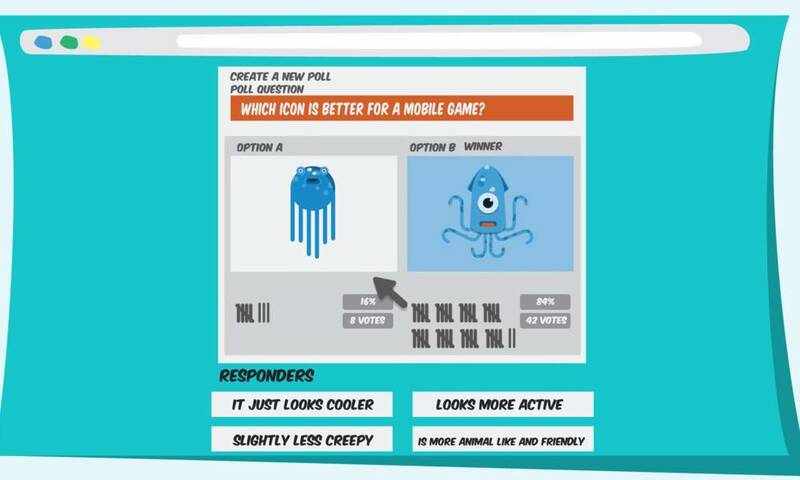 Fun fact: You can run Head-to-Head polls with an odd number of concepts, so go ahead and test 3, 5, or 7 ideas! In a Ranked poll, we’ll present your 3 to 8 ideas all at once to respondents. Each respondent will rank their favorites as #1, #2, and #3, then write a comment explaining their ranking. We’ll aggregate their votes to name an overall winner and rank the rest of the ideas. What’s the difference between a Head-to-Head Poll and a Ranked Poll? Both the Head-to-Head and Ranked polls can test up to 8 ideas. However, the manner in which each poll is conducted is different . In a Ranked Poll, your ideas are all presented at one time, in a single poll. Respondents rank their choices and write an explanation as to why they ranked them this way. This yields less written customer feedback than in a Head-to-Head scenario, because it is only one poll. But because it is only one poll, the Ranked Poll usually takes less time to complete* and costs less to conduct**. 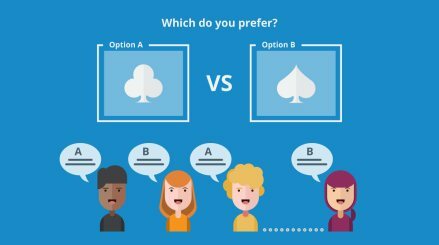 In a Head-to-Head poll, your ideas are presented in round-robin fashion, meaning each idea is tested head-to-head against every other idea in the set. This yields the most written feedback because respondents participate in multiple polls. Your concepts will be ranked according to aggregate poll results. Recommended for Any idea where you don't have several iterations to compare and just need feedback on one thing. Creative concepts where you have 3 or more options that you need to narrow down Respondents rank their favorites (1st, 2nd, 3rd choice) and tell you why. Creative concepts where you have 2 or more options and need the most customer feedback to determine a winner. Each option is tested against every other option.